If you are new Venturing leader or a seasoned veteran, training helps to deliver a quality program to your crew. The first step is to learn about Venturing. This training illustrates how using the Venturing program planning process can get a Venturing crew up and running and off to a successful start. This is available online. Many of the training courses are available online. The BSA calls these modules e-Learning and the course results in a certificate card that you can print out. The course also registers your training in the membership database for council records. 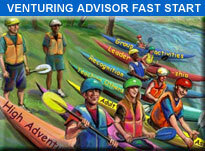 Go to the BSA Online Learning Center and select Venturing Advisor Fast Start for all adult Venturing leader positions including Advisors, Asst. Advisors and Venturing Crew committees. This training provides an overview of the developmental transition experienced by young people of Venturing age and how those transitions relate to the personal safety concerns of the Venturing program. Go to the BSA Online Learning Center and select Venuturing Youth Protection Training for all adult Venturing leader positions including Advisors, Asst. Advisors and Venturing Crew committees. Developed for Venturing Advisors, assistant Advisors, and crew committee members, this training incorporates Venturing’s current adult leader training. There are five sessions: Here’s Venturing, Understanding and Protecting Youth, Leadership and Organization, Awards and Recognition, and Resources and Program Planning. These sessions may be offered at one time or individually. It usually takes about 5 hours to complete. Go to the Last Frontier Council training site or search this site for postings of upcoming training. If you are affialated with a Venturing Crew that is outdoor oriented, this two day course can offer valuable tips for outdoor cooking, how to set up camp, conduct an interfaith worship, plan an educational campfire program, learn basic rope skills and knots, learn the safe use of woods tools, safe fire preparation, outdoor first aid and plant and animal identification. The skills taught are based on the outdoor skills found in The Boy Scout Handbook. The course is also ideal for Venturing leaders because it focuses on skills that build confidence and competence in leaders conducting outdoor camping experiences. This syllabus is designed to be used by Advisors to teach leadership skills to all Venturers in the crew. Nine leadership modules each begin with an activity and follow with a reflection. Completion of this course is a requirement for the Venturing Silver Award, and conducting the course is a requirement for the Venturing Advisor Award of Merit. High-adventure resource training designed to introduce and expose Venturing and Boy Scout adult unit leaders to the activities and resources necessary to operate a successful outdoor/high-adventure unit-level program. The Last Frontier Council maintains dedicated Powder Horn and Wood Badge websites for more information. Go to http://www.seascout.org/for_leaders/adult_recognition/adult-seabadge.html for the latest information. Wood Badge is a 6 day course often spread over two 3-day weekends that covers advanced leadership skills in scouting. Wood Badge has evolved to become the core leadership skills for the BSA. The course focuses on strengthening every volunteer’s ability to work with and lead groups of youth and adults. Many people feel their wood badge experience was their most important training in scouting. Go to http://lfcwoodbadge.org/ for the latest information. There is a lot of information available. Where does one start? Here’s a good strategy for a plan you can take. The Venturing Forum is a monthly meeting of Venturers and Venturing Leaders. The meeting location changes each month to give crews the opportunities to explore some of the local adventures Oklahoma has to offer. This forum is similar to a Scouting roundtable except Venturers are encouraged to attend. Fellow Venturers and leaders enjoy fellowship, share ideas and learn about the coming plans for the Venturing District. The Venturing forum is not distinct training but a great way to pick up tips and ideas from other leaders. Updated schedules of training appear on the Last Frontier Council website. All Venturing training opportunities will be listed on this site. Boy Scouting and Cub Scouting leaders should check the Last Frontier Council website. Select the online training you wish to take. The next page will have a hyperlink to take to the training site. If you are new, create an account. You will be asked for your BSA registration number / ID. This number is on your registration card. If you haven’t received a card yet you can call customer service at the Last Frontier Council office at 824-1114. This page is outstanding. Well done Doug and Lisa! The Youth training page is also quite nice. Everything you need to understand the training program in Venturing is right here. Thanks for providing yet another example of us “getting our act together”. I am a Scoutmaster with very poor computer skills and am quite frustrated!! Perhaps you can help me. I have a user name and chosen a password but can not find where to submit it. I want to update my Youth Protection training. Please tell me how to do it !! Thank you. This is your central portal online to get started.